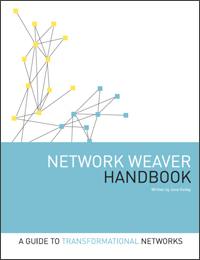 The Network Weaver Handbook is a practical guide for people interested in catalyzing a new network or enhancing an existing one. Each chapter contains a short section describing key concepts, case studies, and many activities. Following each chapter is a resource section with readings, handouts, checklists, and worksheets — which you can easily duplicate and hand out to people in your network.